Atrium of the RPC building on the Main campus of Elizabethtown Community and Technical College located at 620 College Street Rd. Elizabethtown, KY 42701. Elizabethtown Community and Technical College held their Odyssey 2014 event in conjunction with the college’s 50th anniversary open house. 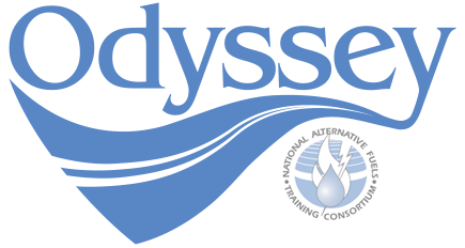 Participants could visit the college, view the programs, and participate in Odyssey demonstrations. The Swope family of dealerships and Herb Jones Chevrolet provided hybrid and electric vehicles to test drive. The Kentucky Propane Gas Association provided a propane powered truck display. Crist Propane Services brought a customized 1949 Chevy truck that had been converted to propane. Whayne Supply displayed a hybrid school bus. Students shared their knowledge of hybrid and electric vehicles with participants, explaining how the vehicles in the ECTC fleet operates. Event Highlights: National AFV Day Odyssey was held at Elizabethtown Community and Technical College on October 18th. The college’s automotive classroom was set up for static displays by the ECTC Green Group, a Kentucky biodiesel representative, Cummins Engine Company and TARC. After viewing these displays, visitors were invited to enter the automotive lab area, where they were given tours by automotive/diesel students. There, visitors were able to view vehicles from Toyota, Nissan, Chevrolet and Mitsubishi. Also displayed were a hybrid school bus, a hybrid transit bus, two propane-powered trucks, and an electric security cart with solar recharging panels. After the tour, visitors were treated to a Ride-and-Drive. Event Highlights: Representatives from Toyota, Honda, Nissan, Chevrolet, and Caterpillar hosted display tables at the entrance to the event. These tables featured information on their respective alternative fuel vehicles. After absorbing this information, visitors were treated to a tour of the auto/diesel department and in-depth information on the hybrid components of each of the displays. Towards the rear of the facility, representatives from the dealerships hosted ride-and-drive events for all of the vehicles. Visitors were able to compare and drive many different vehicles during one event.